The Appekunny Formation is a 1.375 to 1.4 Ga mudstone, and is often referred to as the Appekunny argillite. This formation is the approximate temporal counterpart of the Grayson Shale in the Big Belt Mountains (Fedonkin and Yochelson, 2002) and can appear green in color, due to the large amount of chlorite minerals. once “alive” and merit further study. 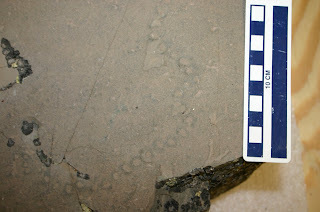 In 1972, Horodyski discovered a fossil he referred to as “problematic bedding-plane markings, each resembling a string of flat beads” near Apikuni Mountain (formerly Appekunny Mountain; Horodyski, 1982a, 1983a, 1985a, 1993a,b). The validity and taxonomy of these markings were questioned for years by Horodyski and others. Often referred to as dubiofossils, in 1991 they were interpreted for the first time, as fossils of a megascopic organism. Yochelson et al. (1993) interpreted the remains to be “metaphyte or metazoan body fossils and/or trace fossils, although evidence of their organic origin is still not conclusive.” After the death of Horodyski, Fedonkin and Yochelson (2002) continued to work on the “string-of-bead” fossils. 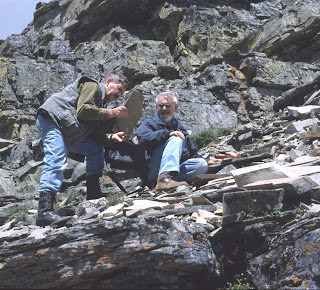 Together they concluded that the remains belonged to a new type of eucaryote, which they named Horodyskia moniliformis (above, right; Fedonkin and Yochelson, 2002), in honor of the contributions of Horodyski to Precambrian paleontology. Similar fossils have also been recognized from rocks of comparable age in western Australia. Growth stages have been recognized for Horodyskia and its presence in an argillite signifies that it would have possessed a highly specialized mode of life. These fossil organisms are considerably older than other accepted multicellular organisms, making this a significant discovery. 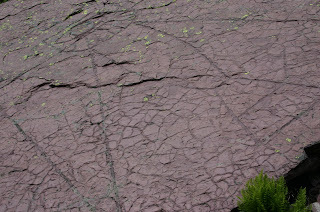 The Precambrian Grinnell Formation is composed of an argillite, similar to the Appekunny Formation. The Grinnell argillite is rich in hematite, with occasional green banding due to the presence of chlorite (above). Fossils from this formation are rare, with only three areas documented thus far. One occurrence of mound-shaped stromatolites was discovered in the summer of 1953 along Going-to-the-Sun Road in the St. Mary Valley (left). These stromatolites were identified as Collenia symmetrica, Cryptozoon occidentale and Collenia undosa (Rezak, 1957). 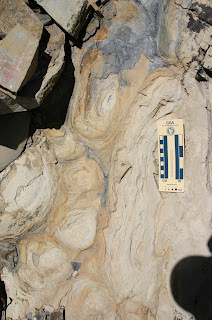 Mound-shaped stromatolites are also found in two locations on Mt. Henkel (Horodyski, 1983a, 1989). The scarcity of these fossils is most likely due to the high rate of deposition of terrigenous sediment that would have clouded the waters where these fossils attempted to survive. The algal components of stromatolites require clear waters in order to utilize photosynthesis. A high content of silt in the water would likely have halted this process. Earhart, R.L., Raup, O.B., Whipple, J.W., Isom, A.L. and Davis, G.A., 1989, Geologic maps, cross section, and photographs of the central part of Glacier National Park, Montana: U.S. Geological Survey, Miscellaneous Investigations Series Map I-1508-B, scale 1:69500. Fedonkin, M.A., Yochelson, E.L. and Horodyski, R.J., 1994, Ancient Metazoa: National Geographic Research and Exploration, v. 10, p. 200-223. Fedonkin, M.A. and Yochelson, E.L., 2002, Middle Proterozoic (1.5 Ga) Horodyskia moniliformis Yochelson and Fedonkin, the Oldest Known Tissue-Grade Colonial Eucaryote: Washington, D.C., Smithsonian Contributions to Paleobiology 94, 29 p.
Horodyski, R.J., 1981, Pseudomicrofossils and altered microfossils from a Middle Proterozoic Shale, Belt Supergroup, Montana: Precambrian Research, v. 16, p. 143-154. Horodyski, R.J., 1982a, Problematic bedding-plane markings from the Middle Proterozoic Appekunny Argillite, Belt Supergroup, Northwestern Montana: Journal of Paleontology, v. 56, p. 882-889. Horodyski, R.J., 1983a, Sedimentary geology and stromatolites of the Middle Proterozoic Belt Supergroup, Glacier National Park, Montana: Precambrian Research, v. 20, p. 391-425. Horodyski, R.J., 1985a, Stromatolites and Paleontology of the Middle Proterozoic Belt Supergroup, Glacier National Park, Montana, in Whipple, J.W., O.B. Raup, Kelty, T., Davis, G., and Horodyski, R., eds., A field guidebook to the geology of Glacier National Park, Montana and vicinity: Society for Sedimentary Geologist (SEPM) midyear meeting field guide, 19 p.
Horodyski, R.J., 1985b, Stromatolites of the Middle Proterozoic Belt Supergroup, Glacier National Park, Montana: Summary and a comment on the Relationships between their Morphology and Paleoenvironment, in Toomey, D.F., and Nitecki, M.H., eds., Paleoalgology: Contemporary Research and Applications: Berlin-Heildelberg, p. 34-39. Horodyski, R.J., 1993a, Paleontology of Proterozoic shales and mudstones: Examples from the Belt Supergroup, Chuar Group, and Pahrump Group, western U.S.A: Precambrian Research v. 61, no. 3-4, p. 241-278. (microfiche appendix of 77 pages). Rezak, R., 1957, Stromatolites of the Belt Series in Glacier National Park and vicinity, Montana: U.S. Geological Survey Professional Paper 294-D, p. 127-154. Yochelson, E.L., Fedonkin, M.A. 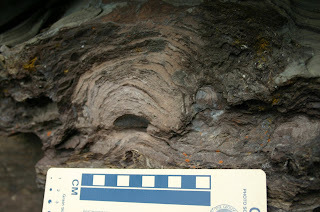 and Horodyski, R.A., 1993, Evidence of life in the Appekunny Formation (1.2-1.4 BY), Glacier National Park, Montana. Geological Society of America, Abstracts with Programs, v. 25, p. 268A. The Prichard Formation, 1.375 to 1.4 Ga sandstone and siltstones, is only found on the western side of the park and is believed to be the age equivalent of the Altyn Formation, found in the eastern portion of Glacier National Park. This formation has been reported to contain microfossils and pseudomicrofossils (Horodyski, 1981). 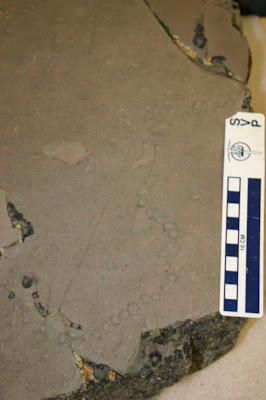 The microfossils found in the dark gray mudstones of the Prichard Formation are of interest due to the fact that they demonstrate the effects of burial metamorphism on organic-walled microfossils. The fossils, which consist of black carbonaceous films, are very rare and poorly preserved, with only 12 known thus far. Due to the extent of their altered state, these fossils cannot be identified to the genus level and are therefore not useful for biostratigraphic correlations. 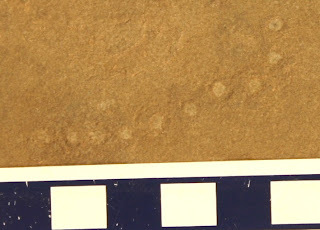 The pseudomicrofossils from the formation occur as spheroids and filaments and illustrate an occurrence of non-biogenic carbonaceous microstructures that could be mistaken as authentic fossils (Horodyski 1981, 1993a). The Altyn Formation, found in the eastern portion of Glacier National Park, is composed predominantly of 1.350 to 1.450 Ga limestones and dolomite. When the park was studied by paleontologists such as Charles Walcott around 1914, this formation was often referred to as the “Newland Limestone,” a formation known from the Big Belt and Little Belt Mountains. The Fentons noted a stratigraphic error made by Walcott in assigning Weedia tuberose to the Altyn Formation. They reassigned this genus to the Siyeh Formation and also identified Beltina cf. danaii in the park (Fenton and Fenton, 1931, 1937; Horodyski, 1985a, 1993b). However, this remains an important discovery in that it is one of the earliest published reports of fossils from the park. One of the significant contributions to the park’s paleontology in the 1930s was the description of a massive bed of stromatolites located near Apikuni Falls (also known as Appekunny Falls) in the upper Altyn Limestone (Fenton and Fenton, 1931). These columnar stromatolites are located in a light gray to tan limestone that is some 6 m thick at the foot of Apikuni Mountain. They were named Collenia columnaris by Fenton and Fenton, with two other locations containing C. columnaris identified from within the park (Fenton and Fenton, 1931, 1937; Horodyski, 1977). 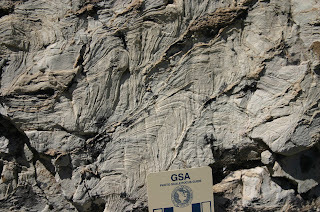 Another stromatolite group occurring above the C. columnaris zone was assigned to Baicalia by White (1970). Ross (1959) notes that the zones are well developed on both Apikuni (“Appekunny”) and Divide Mountains, but poorly developed or absent in other areas, making it a discontinuous zone in the Altyn Formation. Horodyski (1976a) studied these stromatolites in great detail, describing three macrostructural varieties that occur in this horizon. In 1957, Rezak reassigned Collenia columnaris to Collenia frequens without explanation, assigning it as a “zone” due to its presence in two new locations (Ross and Rezak, 1959). Horodyski (1985a) took this a step further and referred to these stromatolites as “highly elongated, inclined stromatolites,” rather than referring to them by a genus name. However, Horodyski still referred to the group Baicalia interchangabally with “branching stromatolite” (left; Horodyski, 1985a). Baicalia is a branching columnar stromatolite forming in subtidal areas, where C. columnaris is a highly elongated, unbranched, columnar stromatolite living in quiet waters below the tidal zone. These stromatolites are tightly packed next to one another and would have formed reeflike masses similar to those seen in the vicinity of the contemporary Bahamas. During their time in the park Fenton and Fenton (1931, 1937) also identified three new species from the Altyn Formation: Newlandia sarcinula, Collenia albertensis and Morania antique, although Rezak (1957) reassigns Collenia albertensis to Collenia frequens. White (1974a,b, 1979) also reports on an assemblage of microfossils that are comparable to modern blue-green algae and unicellular green algae from black chert found within the Altyn Formation (Horodyski, 1993b). Circular "trace fossils" found in the 1960s from the Altyn Formation have since been found to be pseudofossils that were made by modern bees (right; Sando, 1972). Fenton, C.L. and Fenton, M.A., 1931, Algae and algal beds in the Belt Series of Glacier National Park: Journal of Geology, v. 39, p. 670-686. Fenton, C.L. and Fenton, M.A., 1937, Belt Series of the north: Stratigraphy, sedimentation, paleontology: Geological Society of America Bulletin, v. 48, p. 1873-1969. Horodyski, R.J., 1976a, Stromatolites from the Middle Proterozoic Altyn Limestone, Glacier National Park, Montana, in Walter, M.R., ed., Stromatolites: Amsterdam, Elsevier, Developments in Sedimentology 20. 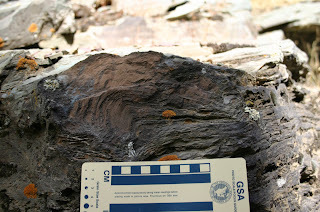 Horodyski, R.J., 1977, Environmental influences on columnar stromatolite branching patterns: Examples from the Middle Proterozoic Belt Supergroup, Glacier National Park, Montana: Journal of Paleontology, v. 51, p. 661-671. Ross, C.P., 1959, Geology of Glacier National Park and the Flathead region, northwestern Montana: U.S. Geological Survey Professional Paper, 296, 125 p.
Ross, C.P., and Rezak, R., 1959, The rocks and fossils of Glacier National Park: The story of their origin and history: U.S. Geological Survey Professional Paper 294-K, p. 401-439. Sando, W., 1972, Bee-nest pseudofossils from Montana, Wyoming, and South-West Africa: Journal of Paleontology, v. 46, no. 3, p. 421-425. White, B., 1970, Algal stromatolites, depositional environments and age of the Altyn Formation of Montana: Geological Society of America, Abstracts with Programs, v. 2, p. 719-720. White, B., 1974a, Microfossils from the Late Precambrian Altyn Formation of Glacier National Park, Montana: Geological Society of America, Abstracts with Programs, v. 6, p. 85. White, B., 1974b, Microfossils from the Late Precambrian Altyn Formation of Montana: Nature, v. 247, p. 452-453. White, B., 1979, Stratigraphy and microfossils of the Precambrian Altyn Formation of Glacier National Park, Montana, in Linn, R.M., ed., Proceedings of the First Conference of Scientific Research in the National Parks, v. 2, p. 727-735. White, B., 1984, Stromatolites and associated facies in shallowing-upward cycles from the Middle Proterozoic Altyn Formation of Glacier National Park, Montana: Precambrian Research, v. 24, no. 1, p. 1-26. White, B. and Pedone, V.A., 1975, A new microfossil locality in the Precambrian Altyn Formation of Montana: American Association of Petroleum Geologist- Society for Sedimentary Geologist (AAPG-SEPM), Abstracts with Programs, v. 2, p. 80-81. This Labor Day, from 10:30 a.m. to close, wear any football team logo into any Chick-fil-A location for a FREE three-count of Chick-n-Strips. Since I have just returned from my honeymoon to Glacier National Park, I thought it would be fun to talk about some of the geology and paleontology from that part of the world. A little background on why I am talking about this first. I am not calling myself an authority by any stretch of the mind, don't get me wrong! I worked in Glacier during the summer of 2005 as the park paleontologist and Geoscientists-in-the-Park sponsored by the Geological Society of America GeoCorps internship, in association with the National Park Service Geological Resources Division. I was hired to write the paleontological resource report for the park and spent 5 months living in the park, which was awesome. During that time I learned quite a bit about the geology and paleontology of the park and published one paper giving an overview of the park paleontology (where the info for this series is coming from if you would like to read ahead). Another interesting side affect of the project was learning about all of the interesting people who have worked in the park. So I thought I would start this series off with a post about the people who did most of the paleontological work that is known for the park. I hope this series is interesting and useful to some. Since before Glacier National Parks establishment in 1910 as the tenth national park in the United States, there have been seven paleontologists who devoted research time to the paleontology of the park. 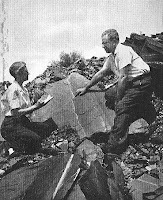 The first major paleontological research was conducted during the summer of 1908 by Charles Doolittle Walcott (right; 1906, 1908), who had been appointed the new Secretary of the Smithsonian Institution in 1907 (Yochelson, 2001). His panoramic photographs of the region from these excursions assisted George Bird Grinnell, who was a major player in the establishment of the park, to persuade congress to preserve the area. Walcott returned to the area in 1914, after his discovery of Cambrian fossils in the Burgess Shale of British Columbia, with his findings being published later that year (Walcott, 1914). Two paleontologists, Carroll and Mildred Fenton (left), continued the work during the 1930s, publishing four papers on the area from 1931 to 1939 (Fenton and Fenton 1931, 1933, 1937; Fenton, 1939). In the 1950s, Richard Rezak (1953, 1954, 1957) conducted his dissertation research within the park and worked with Clyde P. Ross on a publication of the geology and paleontology of the park for the U.S. Geological Survey (Ross and Rezak, 1959). Rezak also wrote the first summary of stromatolites known from the Belt Series of GLAC. The 1970s-1980s seem to be the peak of paleontological research within Glacier. During the 1970s to early 1980s, Brian White worked extensively on the columnar stromatolites found in the upper Altyn Formation. White published six reports (White, 1970, 1974a,b, 1979, 1984; White and Pedone, 1975) about these stromatolites, along with reports of microfossils from the Altyn Formation. The 1970s also brought with it the man who would complete the bulk of the research done on the parks paleontological resources, to date. Robert J. Horodyski completed his dissertation on the stromatolites and paleoecology of the park in 1973 (Horodyski, 1973). From 1975 to 1994, he went on to publish and co-author over 15 reports on many aspects of the paleontology of the park. In the mid-1990s, Horodyski began to work on pseudofossils from the Appekunny Formation with Mikhail A. Fedonkin of the Russian Academy of Science and Ellis L. Yochelson of the U.S. Geological Survey and Smithsonian Institution (right). Horodyski’s untimely death in 1995 brought an abrupt end to his extensive research within the park. After Horodyski’s death, Fedonkin and Yochelson continued to work in the Appekunny Formation within the park. They have since published their findings on Horodyskia moniliformis (below; Yochelson and Fedonkin, 2000; Fedonkin and Yochelson, 2002), possibly one of the oldest known eucaryotes. Fenton, C.L. and Fenton, M.A., 1933, Algal reefs or bioherms in the Belt series of Montana: Geological Society of America Bulletin, v. 44, p.1135-1142. Fenton, C.L., 1939, Sea floors of Glacier National Park: Scientific Monthly, v. 49, p. 215-226. Horodyski, R.J., 1973, Stromatolites and paleoecology of parts of the Middle Proterozoic Belt Supergroup, Glacier National Park, Montana [Ph.D. dissertation]: Los Angeles, University of California, 264 p.
Rezak, R., 1953, Algal Zones in the Belt Series in the Glacier National Park region, Montana: Bulletin of the Geological Society of America, v. 64, p. 1553. Rezak, R., 1954, Stromatolite classification in the Belt Series: Science, v. 119, no. 3097, p. 659. Walcott, C.D., 1906, Algonkian formations of northwestern Montana: Bulletin of the Geological Society of America, v. 17, p. 1-28. Walcott, C.D., 1908, Cambrian sections of the Cordilleran area: Smithsonian Miscellaneous Collections, v. 53, no. 5, p. 167-230. Walcott, C.D., 1914, Cambrian Geology and Paleontology. Smithsonian Miscellaneous Collections, v. 64, no. 2, p. 77-156. 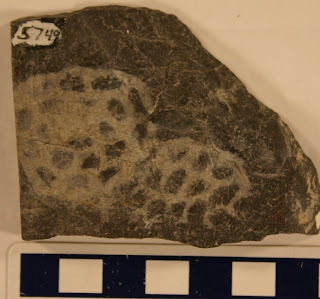 Yochelson, E.L. and Fedonkin, M.A., 2000, A new tissue-grade organism 1.5 billion years old from Montana: Proceedings of the Biological Society of Washington, v. 113, no. 3, p. 843-847. Yochelson, E. L., 2001, Smithsonian Institution Secretary, Charles Doolittle Walcott: Kent, Kent State University Press, 589 p.
4. Interactive Paleo area for young and old alike. 5. Paleo Library and conference rooms. 6. Paleontologists excavating on site for visitors to watch and study. 7. Escorted tours through paleo and archeological sites. 8. Endangered plant viewing areas and study. 9. Hiking areas through desert ecosystem. 10. Connectivity with Floyd Lamb Park, Tule Springs National Register Site, Shadow Ridge High School National Science Foundation, Gilcrease Paleo Camp and State Lands. So far they have collected over 8,000 signatures, but still need some more. If you have the time and are so inclined, please feel free to sign their petition. You can find it here. For more information on why this area is worth preserving please see my pervious blog post on the subject, or you can visit the Tule Springs Ice Age Park website here. Another problem for the Las Vegas area is the proposal to build a major beltway across the Sheep Mountain area. "The proposed action is to identify an alignment, develop a facility type, and preserve a right of way corridor for the Sheep Mountain Parkway in and near northern portions of the City of Las Vegas and City of North Las Vegas....The proposed project would provide a link between the Clark County 215 beltway, US 95, and I-15 (approximately 22 miles). [link]"
Darling, I know we've been together for over 30 years, and we've always promised that we would never keep any secrets from each other. But I think you should brace yourself, because, well, there is one thing I haven't been completely honest about: I'm Jimmy Buffett. I know that for all these years you thought I was "Jimmy Buffett the boat salesman who had to travel a lot for work." But no. I am Jimmy Buffett the multiplatinum recording artist known for such songs as "Margaritaville" and "Son Of A Son Of A Sailor." It's not something I'm very proud of, but it pays the bills. I understand it's a lot to take in right now, but it's true. Your husband and the father of your children wrote and recorded the song "Cheeseburger In Paradise." I actually wrote the lyrics to it the night we met. I understand if you never want to speak to me again. It's been tearing me up inside, lying to you like this. I can't stand all the sneaking around, so as much as it pains me, I must reveal the awful truth. Last night when I told you I was going to run to the store for a second, I actually flew down to Miami and performed in front of 45,000 people for my Year of Still Here Tour. Also, that Country Music Award on my dresser? That wasn't a gag gift like I said. That is real. And I didn't save up for your diamond engagement ring by taking extra shifts at the marina. Something called "Pencil Thin Mustache" bought that ring. It's a song about a guy who wants a pencil thin mustache. Jesus Christ, what have I done? And all those times I told you that I was "going to the Jimmy Buffett concert"? Well, I wasn't attending those concerts, I was standing on stage singing songs for thousands of screaming fans. Yes, the very same people who come up to me on the street and tell me how much they love me. They're called…they're called Parrotheads and I'm sorry! Please, don't let this change the way you think of me. I'm still the same guy I've always been, except that I don't actually sell boats, and occasionally I yell to thousands of people to "get your fins up" and then they wave their hands around above their heads and pretend they're sharks. If it's any consolation, I'm also a bestselling author. That's not so bad, right? My newest novel is called Swine Not? and on the cover there's a picture of me in a hammock next to a pig, and…. Oh God, you know what, just forget I ever mentioned that. I didn't want you to ever have to find out about this, but I knew you were starting to get suspicious. Especially the other night, when we were watching TV and the A&E Biography on Jimmy Buffett came on, and he looked exactly like me, and then they showed a picture of the two of us together while they were talking about his family life. I tried to throw you off the trail by accusing you of having an affair with Jimmy Buffett the singer, but deep down, I knew it was time to come clean. "A Pirate Looks At Forty," "Why Don't We Get Drunk (And Screw)," "Jamaica Mistaica"—all me. Every single one of them. That was me. I'm sure this probably explains a lot, like how we're able to eat for free twice a day, every day at the Margaritaville Café. Also, the reason I don't let you into the garage and scream at you if you even go near the door is because it's not really a garage, it's a $4 million recording studio. And it's tropical- themed. You know our friend Greg Taylor who I always call "Fingers" and who is always carrying around a harmonica? Well, he's Fingers Taylor, the guy who plays the harmonica in my backup band, the…ugh, the Coral Reefers. I know, it sounds stupid! It all sounds so stupid, but it's my life! I still don't know how you didn't figure out my horrible secret last year when we were at that Alan Jackson concert together and he pulled me up on stage. Remember? See, I wasn't doing Jimmy Buffett cover songs for karaoke, I was actually being Jimmy Buffett because I am him, and I was performing songs that I wrote, sometimes right when you were in the next room with the kids. Oh my God, the kids! They must never find out." Thanks to Julia for the heads up!! I am getting married today!! See you all upon my return back from the honeymoon! "Gustavus Adolphus College invites applications for a tenure-track position of Associate Professor for the Department of Geology to begin September 1, 2009. We seek a broadly trained earth scientist with an established record of excellence in teaching and research in the general areas of paleontology and sedimentology/stratigraphy, with a sincere interest in undergraduate teaching in a liberal arts setting. Strong preference will be given to candidates qualified for an associate professor level appointment, candidates with significant experience at the assistant professor level will also be considered. Primary responsibilities will include teaching courses in paleontology, sedimentology/stratigraphy, and historical geology as well as sharing in the introductory course. The development of additional courses (including January Term courses with opportunity for significant travel) related to the candidate's specialty is encouraged. Undergraduate research is a requirement of the Geology major at Gustavus, and the candidate is expected to help initiate and supervise student theses in the general "soft rock" area. The Geology Department at Gustavus Adolphus College consists of three full-time members. The Department is committed to providing a curriculum for our majors that is field- and research-oriented, and also contributes significantly to the general education program of the College. As part of our diversity initiative, we are particularly interested in candidates with experiences and interests in culturally diverse groups or settings. For more details, visit the department web site at: http://gustavus.edu/academics/geology/ or contact Dr. James Welsh at 507-933-7335 or welsh@gustavus.edu. Review of applications will begin on October 15, and continue until the position is filled. Preliminary interviews will be held at the national GSA Meeting in Houston. Gustavus Adolphus College is a coeducational, private, Lutheran (ELCA), residential, national liberal arts college of 2500 students. From the ReadyMade Blog Click here to see larger image so you can read the fine print. The newest volume of Palaeontologia Electronica is now available online. There is a fun book review of "Bonebeds: Genesis, Analysis, and Paleobiological Significance" by my friend Jean-Pierre Cavigelli that I encourage you to read also! To be slime or not to be slime, that is the question? Ever since a new paper by Kaye et al. came out this week in PLoS One, the Paleo list servers and Blog's have been buzzing. Brain from Laelaps sums the papers results up best here by stating: "...Sampling a variety of genera from Hell Creek and elsewhere, researchers hypothesize that the structures that look like blood vessels and cells from the famous Tyrannosaurus femur are really just biofilm, slimy accumulations of bacteria that oozed into the bone and took the shape of the structures. What's more, the published data from the Tyrannosaurus protein studies showed the presence of at least some bacterial contamination, and the authors of the PLoS paper suggest that the bacteria might have contained collagen-like proteins and therefore made the findings of the earlier studies ambiguous...."
Carl Zimmer gets the perspective of Mary Schweitzer, whose original studies sparked this retest of methods: "There really isn’t a lot new here, although I really welcome that SOMEone is attempting to look at and repeat the studies we conducted. There are really several errors in wording (and spelling and grammar) in the paper by Kaye et al. that seem to underlie a fundamental misunderstanding of our work, our data and our interpretations...." Read her entire statement here (about halfway down the page, although the entire article is worth reading). Read this: Birth control to be considered abortion in the future? Check out this article on Living the Scientific Life. Another Bush Administration Backdoor Attack on Reproductive Rights.